Our street was a hectic swirl of Halloween Guisers/Trick or Treaters. We had friends over to join in the craziness. The boys and I left D in the flat to entertain the guising public while we went scavenging for treats. The close stairways were packed with witches, weirwolves and ghouls of every shape and colour. When we got back the candy I had bought was all gone (and I bought a lot!!). The signs on the door came down and the boys were put in the bath to wash off the remnants of a long Halloween day of fun at school, nursery and the street. 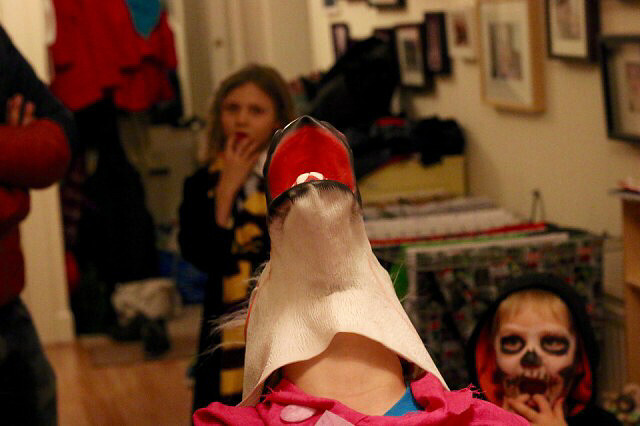 One of our neighbours came dressed as the Scottish animal, the unicorn.